Click Invoice Items. This page lists all of the invoice items you created. Each item entry is an active link to the item's details. 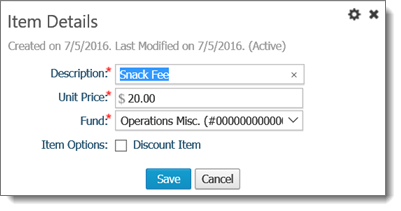 Click the link for the invoice item you want to edit. The Item Details window opens to show you the details for the item. Click Edit Item to put the details in edit mode. If the item is currently being used by a template, any change you make automatically updates the template. Any invoices currently using the template, however, are not affected by the change. If the fund associated with the item no longer exists, you are prompted to select a new fund. Make the desired changes to the item's details. Click Save. A message is displayed to inform you that the change was made successfully. Click Close to exit the Item Details window. You return to the Invoice Items page. The details for the selected item are updated in accordance with your changes.